Good Morning! 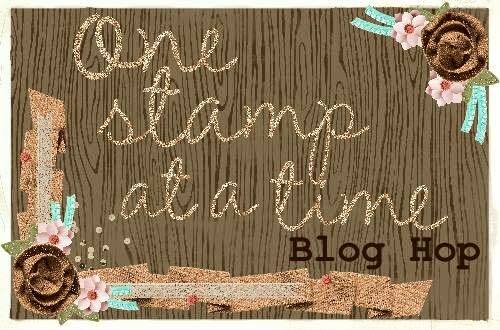 Welcome to the One Stamp at a Time May Blog Hop! I love that the weather is warming up! This month we are having a spring fling as our theme is flowers! If you are joining me from Dena's blog, I am so glad you continued on. There are so many awesome creations this month. Please be sure to visit them all and comment to show some love. When I think of spring time and flower blooms, I always think of the bees that help pollinate and create all these lovelies! With that in mind, I used the used the color theme of yellow and black. I decided to use the Stampin 'Up set "Garden in Bloom" for this month's card creation. I love the soft colors that the So Saffron and Hello Honey colors add to the blooms. I used Pear Pizzazz for the leaves and added a cute little bee to buzz around. This card would surely brighten someone's day.... it is just so cheery! In keeping with my color scheme and to generate a little more buzz (he...he) ....... I created a sidekick for my card. I love this cute little bee using the Curvy Keepsake die set. I believe this bee may have a hard time pollinating the flower on the top. I first cut out the box from basic black card stock and added the stripes by cutting strips of So Saffron and gluing them to the sides. I did up cycle on this card and punched the "wings" from a clear plastic cover from the front of a toy box! I love how you can incorporate various items into creations. I hope you have enjoyed my creations and will continue to visit all the other bloggers that have joined us. Just click the next button to visit Alisa's blog. I also have included the other hoppers below in case you lose your way. If you would like to order these products, I would be happy to assist you. If you are looking to add several items to your stash, now is a great time to join Stampin' Up. You can join for $99 and pick $125 worth of products. The new annual catalog goes into effect June 1st. New! If you join, you get a free month of Paper Pumpkin. Don't know what Paper Pumpkin is? Contact me and I will spill the beans! I am so glad that you have visited my blog and until next time..... Happy Stampin! What a beautiful card Kim and I love your bumblebee!! Oh my goodness how adorable is that little bee! I feel a case coming on for that curvy keepsake. I adore your card too. Super sweet! such a springy set. Love the bees. Awe I like your classy card but that bee is just too cute!!! I need one for sure! Oh my gosh your bee is too stinkin' cute! Thanks for sharing! Beautiful card, and the bee box is just adorable! what a wonderful bee box, love it! Thanks for sharing! Such sweet projects! That bee box is too cute! Need to case that for sure. So cute & summery!!! That bee is adorable!